WILLOUGHBY HILLS – A spirit of cooperation was a major theme reflected during the State of the Cities breakfast sponsored by Willoughby Western Lake County Chamber of Commerce (WWLCCC). Six mayors of cities in western Lake County spoke on their cities’ achievements, issues and goals at the event, held Feb. 14 at St. Noel’s Banquet Center. The speakers were Dennis Morley of Eastlake, Douglas Davidson of Kirtland, John Barbish of Wickliffe, Robert Fiala of Willoughby, Robert Weger of Willoughby Hills and Richard Regovich of Willowick. WWLCCC also represents Lakeline and Timberlake. WWLCCC President / CEO Karen Tercek began the meeting with an introduction of WWLCCC board members and Matt Urankar, the new membership and events manager. Regovich, who best expressed the spirit of cooperation, said he has seen positive collaboration among the Lake County mayors in the three years he has been mayor. Willowick, Eastlake and Willoughby, plus Laketran, are collaborating to develop Vine Street. Willowick, Kirtland and Wickliffe each use Economic Development Manager Monica Drake to help grow the business community. Weger said it is a new day in Willoughby Hills, which had a period of conflict, primarily in 2018. “We are going to work together,” he said. Morley reported that Eastlake had a $2.2 million carryover from 2018 and job growth in the last four years resulting in a $ 1.9 million increase in income tax. The city will be adding two police officers, a service worker, and a Building Department employee, plus two fire trucks and police cars. Among the Eastlake highlights, 4 Points by Sheraton held an opening following a $10 million renovation, and Eastlake was one of six cities to receive a 2018 Crown Communities award for the Miracle League Park. Two major issues facing Kirtland last year, as reported by Davidson, was the Fiscal Review Task Force involving 125 people to determine how to grow the city, completion of five miles of repaving Route 306, and hiring Economic Development Manager Monica Drake to help grow small businesses. Kirtland received one of 50 AAA Platinum Safety Awards. In business news, the Kirtland Creamery has taken over the former Kirtland Car Co. location. Barbish said Wickliffe is focusing on economic development of vacant properties, including a city-owned 11-acre property ideal for a large business. He would like to talk to anyone interested in building, expanding or moving a business. Fiala reported several projects are under development in Willoughby. A 15.5-acre space behind Willoughby near Todd Field, could contain apartments and a parking garage with an elevator that would alleviate the major parking problem in Willoughby. Plans are on the board to develop part of the former Willoughby Junior High School property downtown, a $5 million investment in seven town homes and six senior living homes. A large property on Lost Nation Road, donated to the Cleveland Clinic, will be available for development. Weger talked of financial improvement. In 2008, the city had an $18,000 carryover in the general fund. This year the carryover was $1.5 million. The closing of Giant Eagle left a hole the economy, but Shoppes at Willoughby Hills developer J. Scott Scheel is working to fill that space. The old Sam’s Club will soon have Produce Packaging, which eventually will have 350 employees and a $10 million payroll, and Aldi’s is planning on taking over the former Sear’s hardware building. Regovich said Willowick wants to develop the 12-acre lakefront property. “I see restaurants and a boardwalk that we do not have,” he said. He also is interested in developing other commercial properties, including Shoregate Town Center. He said they are working on bringing Michael’s into the Pat Catan’s location. “It is a great time to be in Lake County,” said Tercek, in closing the meeting after a brief question session. 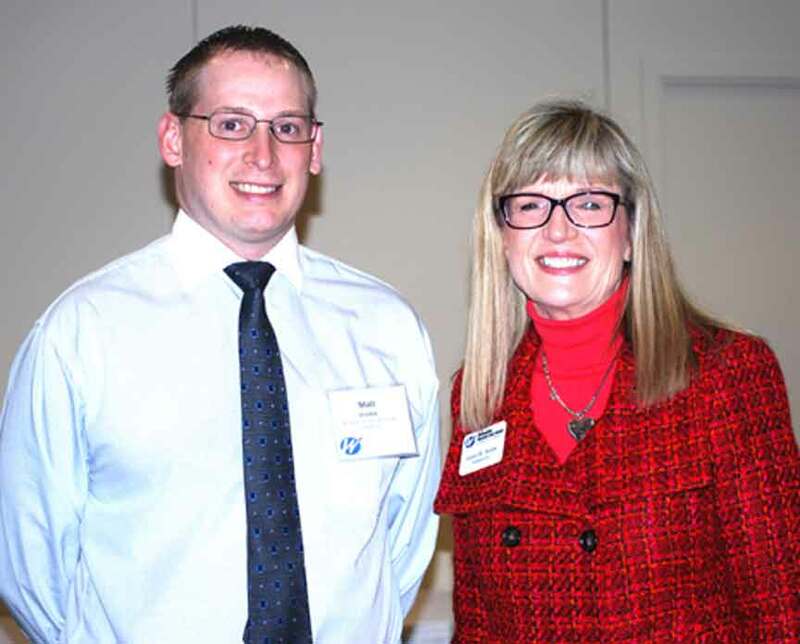 WWLCCC president and CEO Karen Tercek (right) introduced the new membership and events manager Matt Urankar. Tercek served as master of ceremonies for the State of the Cities breakfast.